Here's the volunteer sign up for our competitions this year. We need lots of help at GCM getting the students ready to head out, then on site, and then unloading back at GCM. Some on-site volunteers enter the competition for free. We have the dates and locations for the competitions, but not the times yet. Unfortunately, exact times may not be available until the week of the competition, and they will come out by email, with this SignUpGenius also being updated if time permits. Assume the students will be starting at GCM with a morning rehearsal, getting a lunch break, and then being returned to GCM late at night. Send them with money to buy lunch near GCM (if you are not providing their lunch) and dinner at the competition, and with a jacket for after the performance. They are transported to and from competitions by bus. A few pit/prop/uniform volunteers can ride on the bus also. - Unload props, pit instruments, other large instruments, guard equipment, jackets, shakos from truck at GCM (late at night). Start in the front of the school to unload the first items, then move to the shed behind the football field to finish unloading and storing. 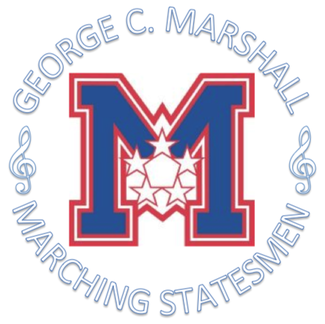 Go to marshallband.org and click on Volunteering to find all the SignUpGenii. PLEASE, if you have to cancel within 24 hours of your slot, remove your name from the SignUpGenius and also email Kelly Sund to let her know. Please contact Tracy McHone at [email protected]. Purchase 6 flats of 24 water bottles in advance, load 2 flats in front seat of each bus so students can take as they board, submit receipt to Treasurer for reimbursement. My friend, Ms. Tran Bao Thi Nguyen, will be glad to help with Props as needed. If you still need me!